While the majority of beach destinations advertise the same gorgeous white sands and blue waters, the Cayman Islands Department of Tourism (DOT) is attempting to set itself apart by incorporating the islands in a surreal and whimsical new ad campaign. 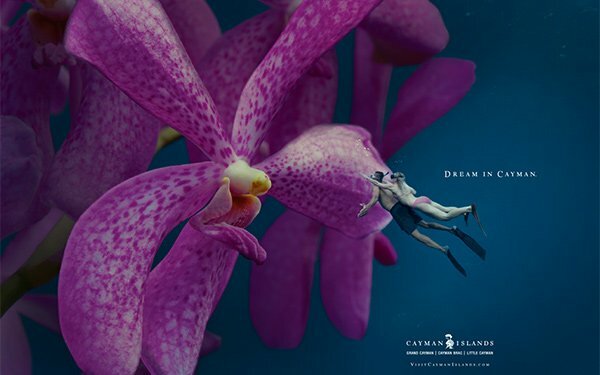 The "Dream in Cayman" creative, developed with The Richards Group, is designed to mimic high-fashion photography with giant images of the island destinations, such as its Crystal Caves and orchid garden. Images are mixed with those of much-smaller travelers engaging in island activities, like scuba-diving or dancing. To further extend this surreal theme, the new TV commercial jingle is a reimagined version of “Beyond the Sea,” sung by local Caymanian Sarah McTaggart,who gives the song a dreamy, breathy vibe. This messaging represents a new direction for the client, pivoting from previous campaigns that revealed the character of Cayman through the smiling, friendly faces of residents. By contrast, the "Dream in Cayman" evolution was a direct result of the client’s desire to further establish the Cayman Islands as a "luxury lifestyle brand." “The best fashion ads leave a lot unsaid, but do a wonderful job of compelling you to buy into the brand and embrace the lifestyle," explains Ron Henderson, creative director, The Richards Group. The media plan is also slightly tweaked from earlier campaigns to embrace more luxury lifestyle environments. This positioning includes print appearing across several verticals, including travel, trade, affluent, bridal and diving. TV spots are appearing via spot and nationally, as well as online programs running across multiple travel verticals. Ads will also run on digital video (Hulu, YouTube), supported with paid search and social platforms.